Spring cleaning. It is something that I want to do. No, let me make it clear…it is something that I wish I wanted to do. 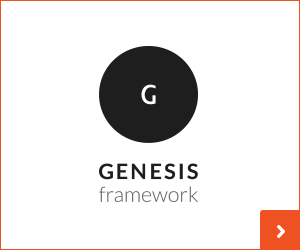 It needs done – no doubt. Winter tends to be the season to collect and gather, making life cozy. Or cluttered. As I look around my house, it is clutter that I have accrued over the past few months. Or I have created the clutter, since I am not an organized person. Good intentions I have, but my organization skills just lead to more clutter, plus the act of organizing does not keep my attention…so, it’s half-assed organization. I wish I was more Type A regarding home organization. Are you organized? I know some of you out there are…what are your tricks? From bedroom closets to kitchen pantries…how do you keep things tidy and organized? But back to spring cleaning…Beyond the organization bit, I do need to purge a bit…that bookshelf I hate, dating back to my college days – it needs to be upgraded to a grownup bookshelf. And those t-shirts I got free, while also in college, they need to go…and those knit shirts that I hate to wear – why are they still taking up room in my closet?!? And can we discuss my kitchen? Yikes. Is there a reason why I have 10 slotted spoons? But only 1.489 decent spatulas. ( 1 spatula has half a handle…not joking.) And my pantry and cupboards…there is no rhyme or reason to any of it…who knows how many cans of cannellini beans or boxes of instant oatmeal are hidden among cans of tuna and dried pasta…Can someone spare me their Type A personality, just for the afternoon? I suppose, at some point in time, I will tackle the closets and cupboards and purge what I no longer have use for and organize that which I do. But until then, I will try to navigate what system I have in action now – however faulty. 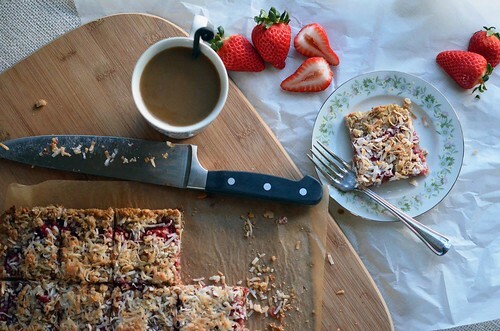 That is how I came about making these fruity bars. 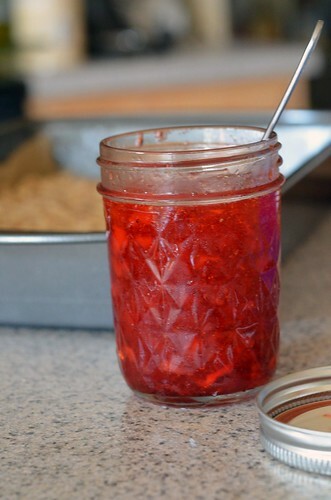 I ran across (let’s pretend like I knew it was there) a jar of strawberry jam that I had made last summer. Oy! My freezer, it too is experiencing the same amount of disarray as my cupboards…everything is just frozen. Anyway, it was the final jar of jam (i think). With the weather hitting the mid 80’s, the trees in bloom, and my daffodils out in abundance….the sudden urge to make a dish that was reminiscent of the weather outside hit me like a Mack truck. 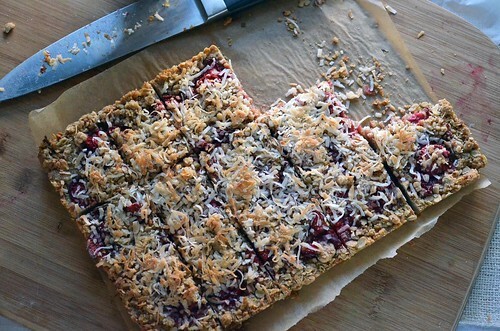 These bars can be made with any fruit/jam combination. I think peach jam with blackberries would be out of this world. Coconut oil was used in combination with butter to make the crust, but if all you have is butter, use butter (not margarine my friends…never margarine). 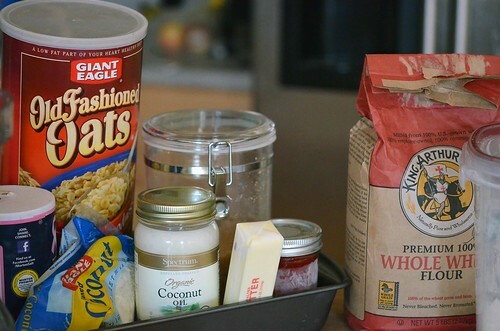 And if you don’t have whole wheat flour…use all purpose. 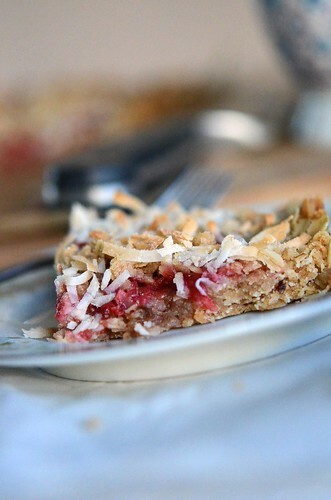 These are a simple dessert that will earn you wows from the crowd…Just make sure your crowd enjoys coconut. p.s. by no means am I a hoarder…just unorganized. Gather your ingredients. I like to get everything out and infront of me and then put them away as I use them. My counter is then clean (minus the crumbs) once the finished product enters the oven. I am an organized baker (kinda). A portion of the sweetened coconut is gonna get toasted. Keep a close eye… if it weren’t for the smell and the smoke steam, mine would have been scorched. See, one more second and I would have gone from gorgeously browned to burnt and gross and ruined. Again, thank heavens for my nose. 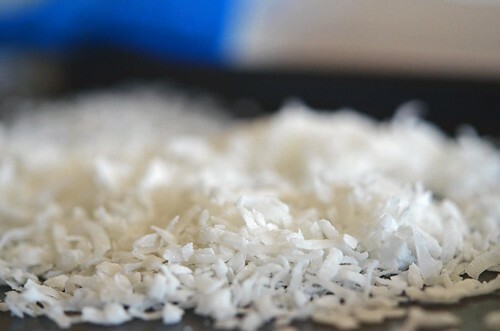 While the coconut cools, the crust is whipped up. A food processor makes this a whiz, but can be made without. It is just cutting butter into dry ingredients. No biggy. Check out the coconut oil. I use it in my baked goods and on my hair…talk about versatile! Crumbly crust, check. I hate the word moist…it almost deterred me from buying that package. Argh. 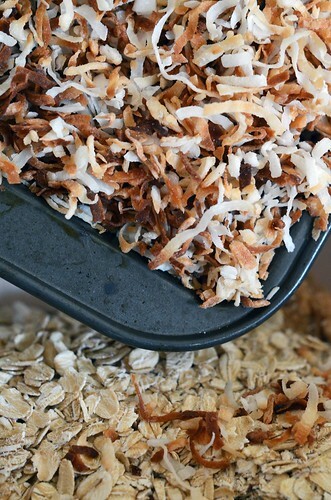 Enter roasted toasted coconut and old fashioned oats. Press! And reserve. Check out the parchment paper sneaking up the side there. I am obsessed with parchment paper. I can not seem to help myself. STRAWBERRY JAM!! I find these jam jars the cutest darn things east of the Mississippi. I am instantly comforted by these jars. Just the sight of one can set my world right again. Strawberry jam covered in fresh strawberry slices. Seriously. 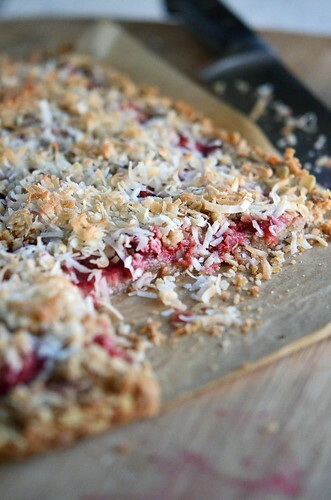 With a final layer of the reserved crust and coconut…we are ready for the oven! Once out of the oven, you will have to let them completely cool before devouring. Bummer I know…but they won’t be completely set until cooled (but if you were to take a sliver when still warm, I will not say a word…I only know they won’t be set until cool because I tried when still hot!) They are best when chilled and eaten cold, but you be the judge. And also a great way to use those first strawberries of the seaon…the ones that you just couldn’t resist, even though you knew that they wouldn’t be as sweet and juicy as you dreamed. Note the white innards of the ones pictured above…I just couldn’t help myself! Oh and hey … leave me comments on how you stay organized! I would love some new tips! 3/4 to 1 Cup Strawberry Jam. Preheat oven to 350°F and place oven rack in the middle position. 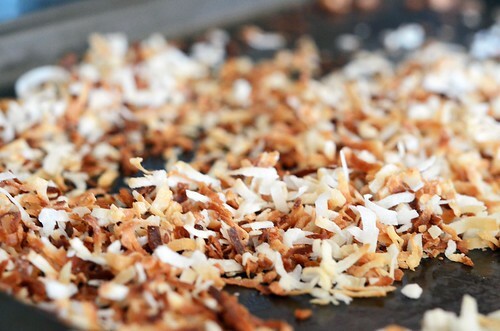 Evenly spread 3/4 Cup of coconut onto a baking sheet and place in preheated oven for 5-8 minutes until golden brown. Keep a close eye here…I nearly burnt mine to a crisp – once you smell it, it is most likely ready. When toasted, remove from oven and let cool. Keep oven at 350. 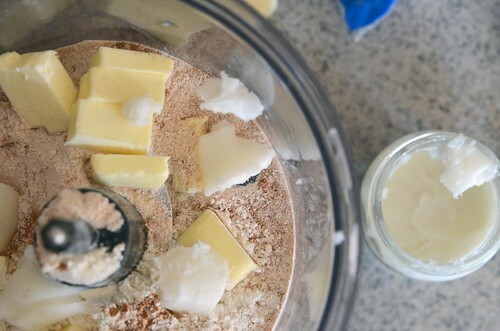 Meanwhile, in a food processor, combine all purpose flour, whole wheat flour, brown sugar, salt, coconut oil, and butter (cut into pats). Pulse until dough forms – it will be crumbly, but will stick together when pressed between your fingers. 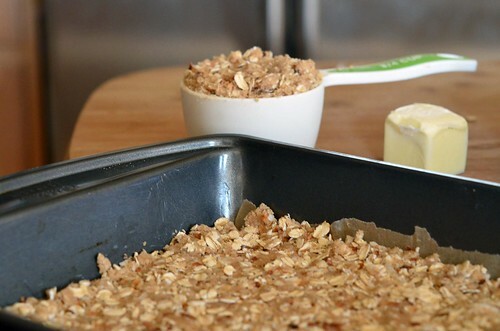 Transfer to a larger bowl and mix in toasted coconut and old fashioned oats. 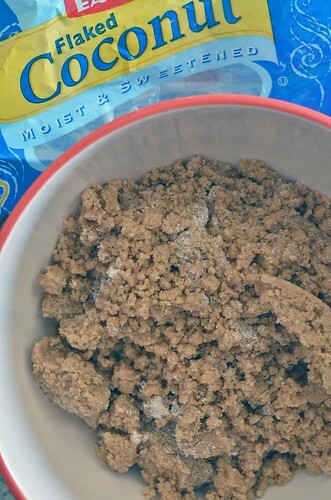 Reserve 3/4 Cup of mixture (topping). Press the remaining mixture into a buttered (or parchment paper lined) 9 x 13 pan. 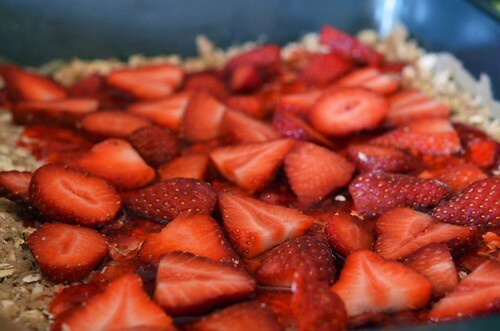 Evenly spread strawberry jam over crust and then evenly spread sliced strawberries atop the jam. 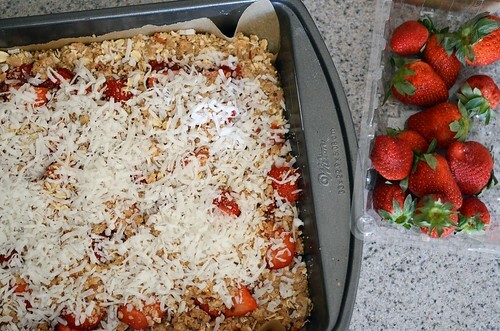 Sprinkle the reserved crust over the top of the strawberries and top with the remaining 3/4 Cup of coconut (untoasted). Place in preheated oven for about 20-30 minutes until the coconut turns golden brown. Remove from oven and let cool completely before cutting. I love them straight from the fridge. They are extra chewy! 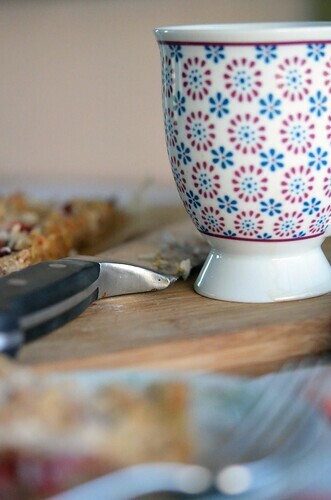 If you are using homemade jam, it may be a bit more runny than store bought and therefore it may make the crust soggy sooner – so definitely store in fridge!